Auch wenn Sie keine Zeit haben, durch ganz Europa zu touren, können Sie während eines Tagesausflugs aus dem norditalienischen Triest ins benachbarte Slowenien kommen. Nachdem Sie die Grenze überquert haben, unternehmen Sie eine geführte Tour durch die slowenische Hauptstadt Ljubljana. Fahren Sie weiter zum malerischen Bleder See, der für seine kirchliche Insel, seine Burg und seine alpine Landschaft bekannt ist. This is a fabulous tour! Our guide Barbara was super friendly and engaging. She shared really interesting information about Slovenia from basic facts to personal experiences to political and social issues.This made the tour extra amazing because she was so open and personable. Barbara also gave us flexibility in Both Bled and Ljubljana to spend the time how we wanted. I would recommend this trip to anyone. Both cities are stunning and the Slovenian people are so fun and friendly. The food is also AMAZING, especially the Bled cream cake...wow! Ljubljana is a hidden gem for foodies and crafty people....so many cute shops and really modern restaurants combined wit traditional farmers markets and food stalls I definitely need to go back! 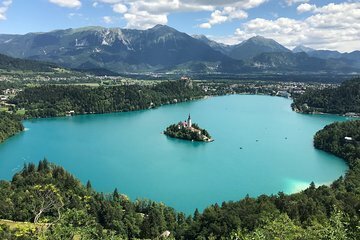 Lake Bled is just as beautiful as it looks in photos -- you won't be disappointed! Our guide was friendly and helpful and we enjoyed touring the castle and having the custard cake in town. We also really enjoyed Ljubljana, it's a lively town and bigger than we expected. You definitely want to do this tour on a nice day, as the lake is so gorgeous and you will be outside most of the time in the capital. Our female Sloveian guide/ driver was excellent. Picked us up from our apartment and brought us back to it. Very comfortable ride there and back, and plenty of free time to wander. Ljubljana was spectacular. The town isn't overrun with tourists and our guide was very knowledgable about the history and development of Ljubljana. Much of the old town remains and the walking tour touched on many of the sites. Lake Bled was an Alpine wonderland of natural beauty. Side treat, I'm a SJ Sharks fan and we visited the ice skating rink where LA King's captain Anze Kopitar played before joining the NHL. This was a simply wonderful day. Lake Bled just beautiful - just like in the photos!! Ljubljana a wonderful diverse city from the medieval castle to the modern architecture. Our driver was just wonderful and full of interesting information. I would totally recommend this tour to anyone. This was a nice tour. Turns out there were only the 2 of us so it was like having a private guide, and he was very knowledgeable and personable. It would have been nice to have some free time in Ljubljana, to perhaps visit the castle or a museum. It would have been nice to have more time in Lake Bled as well, so we could have taken the boat ride to the island or gone up to the castle. The time frame of the tour could have been changed--earlier pick-up, later drop-off. Awesome Tour our guide Dan was fantastic. Good value for money great day beautiful country. Excellent tour in all respects, I can highly recommend to anyone in the Trieste area.